Four Marines Killed In Camp Pendleton Training Accident : The Two-Way The deaths occurred at the base near San Diego during what officials have described as a range maintenance operation. 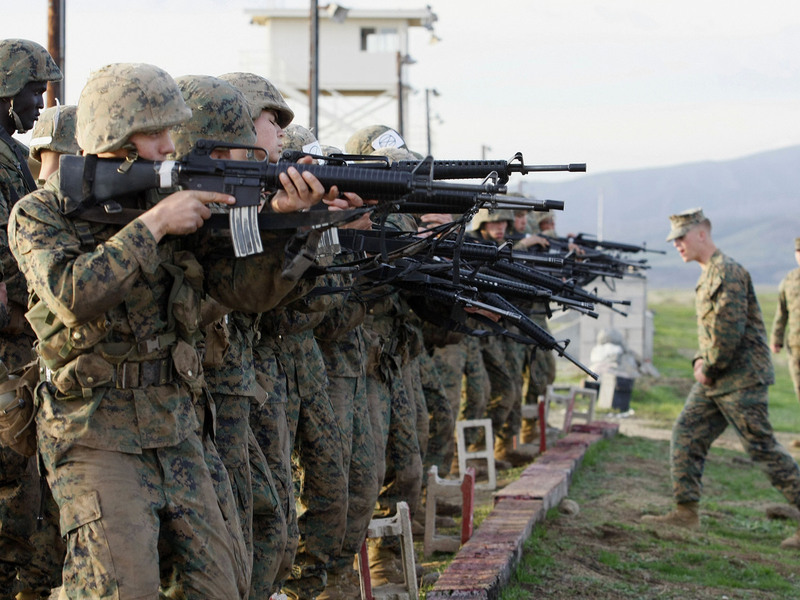 Marine Corps recruits train at the Edson Firing Range at Camp Pendleton Marine Corps Base in 2008. Four Marines have been killed in a training accident at Camp Pendleton, near San Diego, Calif., base officials said. The Associated Press says the accident occurred at 11 a.m. Wednesday "during a range maintenance operation." Reuters quotes Marines spokesman Lt. Ryan Finnegan as saying that the four were killed at the Zulu Impact Area inside the base. "We offer our heartfelt prayers and condolences to the families of the Marines lost today in this tragic accident," said base commander Brig. Gen. John W. Bullard. "Our first priority is to provide the families with the support they need during this difficult time." Officials said they were investigating the cause of the accident but had no further details as yet and did not release the identities of the dead, pending notification of their families, the AP said. "The deaths come about eight months after a mortar explosion killed seven Marines during a live-fire training exercise in Nevada.